By not letting Parliament run Indian Parliamentarians feel so proud of their act like winning a gold medal at CWG 2018. They are getting themselves photographed with placards in their hands as if they are receiving the medal at the podium. Sportsperson sweat out to get laurels, working class sweat out to earn their living and students sweat out to pass out their exams but they tried to sweat out to cause biggest damage to the faith of people. 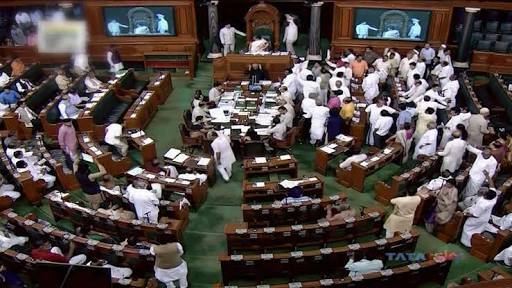 In each of the example mentioned everyone sweats out to achieve something positive, here, we have these bunch of so called public representatives, who instead of doing business for the welfare of the people, sweat out only to waste huge public money by disrupting parliament proceedings. The sole purpose of the Opposition by disrupting Parliament is to settle political scores with the party in power rather than culling out anything meaningful for the people of this country. In a democracy the Opposition has every right to protest and protest voiceferously. But shouldn’t the Opposition be asked whether the the sole purpose of disruption is to embarrass the party in power or to protest for the protection of public welfare. There is no evidence that suggests the positive contribution of the Opposition in Parliament for the benefit of people. The Union Budget was not discussed or debated or not even pressed by the Opposition to bring any changes in certain provisions related to taxation or allocation of funds under certain public welfare schemes. All provisions of the budget have become effective from April 1 without an iota of any protest. We didn’t hear any such voice of the Opposition in challenging any part of the Budget during the entire disruption of Parliament. Is this the right way of protest by the Opposition where previous time and resources are wasted and no meaningful transactions in relation to people’s needs are either raised, discussed or debated ? The return of salary by the MPs for the period of disruption is much more dangerous and disrespectful because by this act these MPs tried to legitimize their uncalled for behaviour. This must be resisted by all quarters. It is like compensating the honest by the dishonest after slapping him for his honesty. The conscious citizens or even the Supreme Court must pressurize the elected public representatives to fix certain hours where they be allowed to protest in the House or outside the House but not let Parliament run completely. These MPs owe much more to the people and nation than to their own political party to settle political scores. ← Has BJP lost to BJP in the two UP by-polls?